I have been back in Taipei for a day and a half, and have yet to see the Parental Units... and this was after all the work they put in to clean up the flooding in my apartment earlier this week. 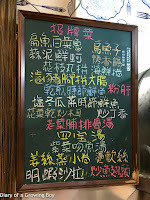 Little Aunt was in town, so we all met up for lunch at Mao Yuan (茂園餐廳). I used to come here when I worked nearby, but it's been a few years. Steamed chicken (白斬雞) - dad always feels that we must order steamed chicken whenever we dine at a decent Taiwanese restaurant, but the truth is that while I like free range chicken for their flavors and meat that's not soft and mushy, the chicken here has tougher and chewier texture than I would prefer. And today it was also more salty than I cared for. Steamed pig's liver (粉肝) - I ordered this for mom, even though I knew this wouldn't pass muster with mom just by looking at the color of the whole lobes of liver. The color was too dark, which meant that the texture was going to be on the firm and dense side. But still OK.
Braised pig trotters and intestines (滷豬腳拼大腸) - actually, dad was the one who ordered this up... not me. But I couldn't be happier, since both of these ingredients are among my favorite things to eat. 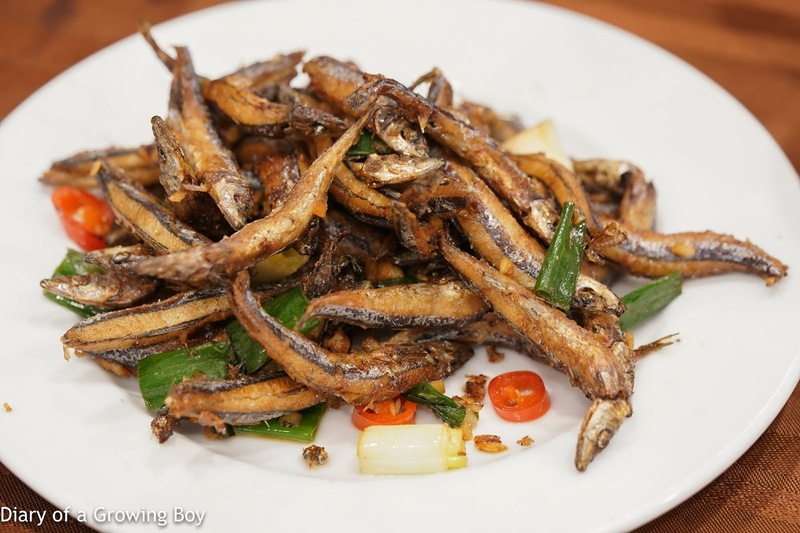 Deep-fried slender sprat (酥炸丁香魚) - I couldn't resist ordering these once I saw them. 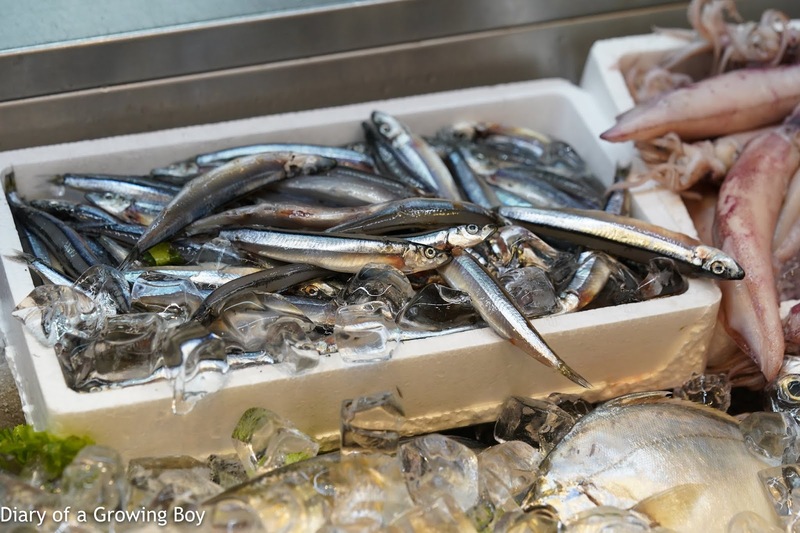 I don't spend a lot of time around fish markets in Hong Kong, but I really haven't seen them around. So when I'm back in Taipei at a place like this, I make sure to get myself a hit... These were so fresh and tasty. Perfectly crispy on the outside. 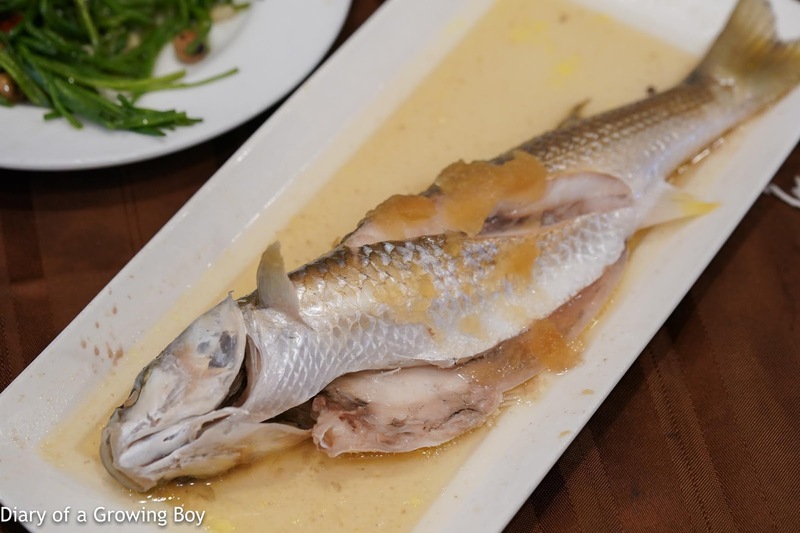 Steamed grey mullet with salted winter melon (鹽冬瓜蒸豆仔魚) - a fish with tender flesh, and very nice when steamed with salted winter melon. 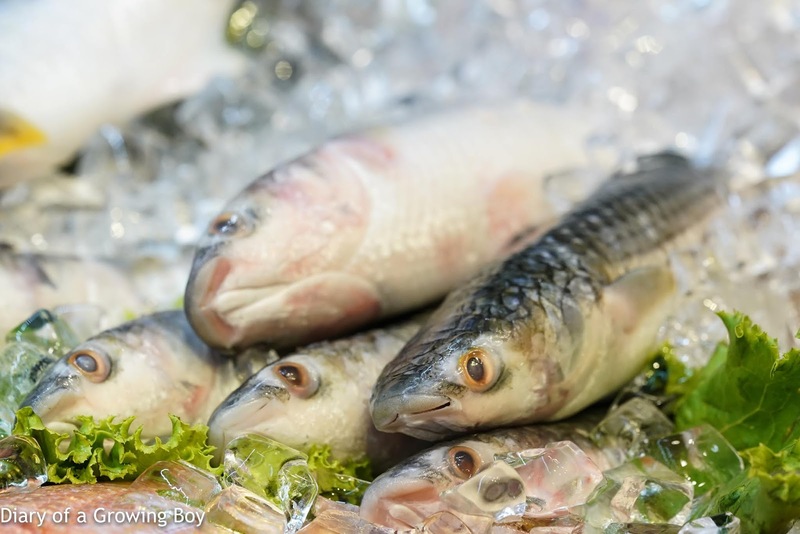 I didn't mind the bones when I can eat something like this... another fish not found in restaurants in Hong Kong. 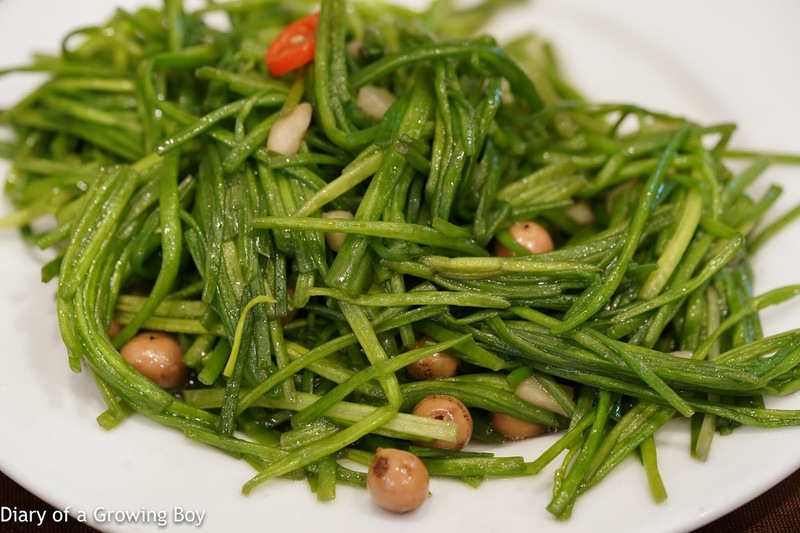 Stir-fried white water snowflake (炒水蓮) - I love this vegetable, because I (almost) only get to have it in Taiwan. And not surprisingly served with pickled manjack fruits (破布子). I've always loved the crunch. 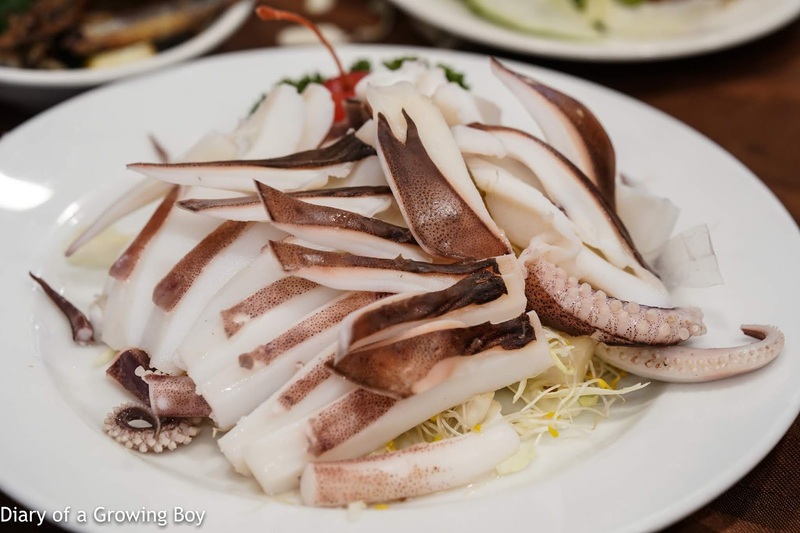 Blanched cuttlefish (燙軟絲) - you don't need to do much when you have fresh ingredients... just a quick blanching would do. And those slices of cuttlefish were so tender and sweet... perfect with the accompanying garlic and chili sauce. This was a lot of food for the four of us, and here's where I had a problem with the restaurant. I understand that restaurants wanna make money, and the more dishes you order, the more money they'll make. But restaurants should also try to make their customers happy, and when restaurant staff try to upsell or push customers to order... I have a issue. The serving of steamed chicken was clearly much too big for the four of us. I would have appreciated the staff suggesting that they change us to a smaller order. I also only wanted one grey mullet because I wanted to try more dishes, but the staff felt I should have gotten more of them - and even suggested that we order one per person. That got me a little pissed off. In the end, it was just a casual family meal, so I didn't make a big deal out of it. I was just happy to have been able to grab some simple food back in my hometown.